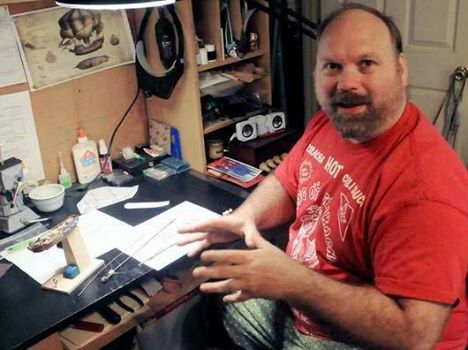 I’ve always been ‘crafty’ or ‘artistic’… I began building models with my father, the first kit I recall building was an AMT Kit called the Gigantics Rampaging Scorpion Kit while my father built a four foot long USS Constitution, from that moment I was hooked. Several years ago I realized that the cost of plastic kits began to skyrocket, and money was very tight, so I began to look at other ways to keep modeling without going broke. 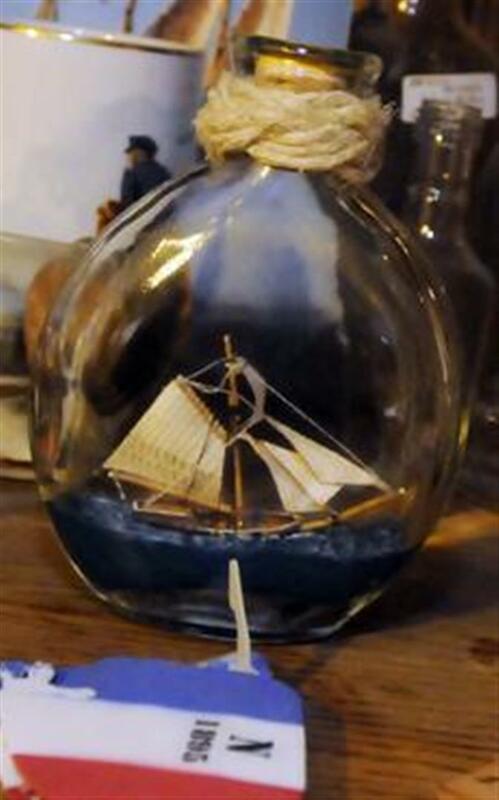 I began to look into scratch building, then one day my wife bought me a small pre-carved all items included Ship in a Bottle kit. I had found the answer to my dilemma, here was the chance to scratch build ships, and make them unique. I love historic research and here again is a hobby that fits my likes, and finely, it’s not only ships that can be bottled, airplanes, houses, science fiction ‘ships’. Building and creating something with the added puzzle of fitting it all into the neck of a bottle really appealed to me. I’m many things; I’m a classily trained artist and illustrator, a web designer, leather worker, amateur historian and recreationist, a disabled veteran, but being one of the few people who are keeping alive the tradition and art of building ships in bottles, well that’s kinda special. 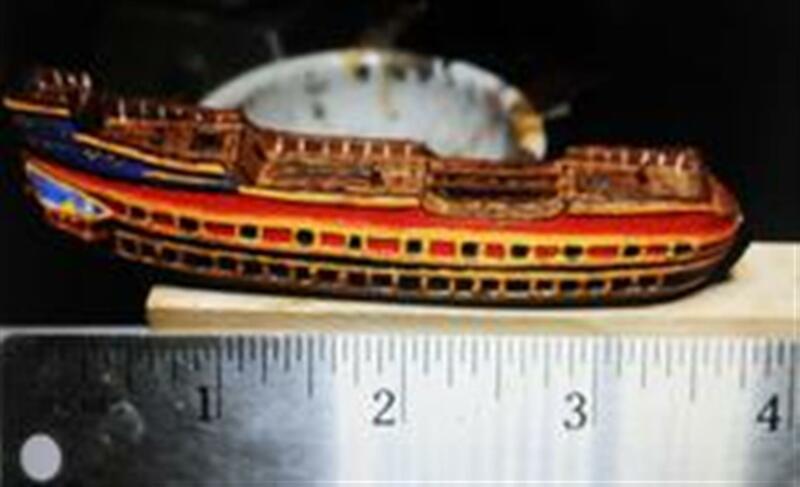 The following is a link to Chris Lemke's HMS Bounty Building Log. Click on the title to follow his progress. Already a leather worker, a model builder and a graphic designer and illustrator, Vine Grove resident Chris Lemke threw himself into another craft that thrives on details about four years ago. Chris Lemke builds ships in bottles such as the HMS Bounty seen on his workbench inside his Vine Grove home. The 42-year-old is mastering the art of building ships in bottles. It’s a dying craft, he said, noting bored sailors started the art long ago, typically building replicas of the ships they were sailing. Ships in bottles might see a boost in recognition, though. The hobby has been listed in the just published 2014 edition of “Chase’s Calendar of Events,” a book listing worldwide holidays, historic anniversaries and similar events. For example, according to Chase’s, today is National Day on Writing, Tuesday is International Stuttering Awareness Day and Wednesday is National Mole Day. Oct. 4, 2014 will be the first National Ships-in-Bottles Day. The hobby is one that blends craftsmanship and history and demands patience and precision. “All the models are done by hand. You carve a wood block and go from there,” Lemke said, looking over his collection of hand-made tools. A ship is constructed with everything on hinges. An untrackable number of work hours later, it’s all collapsed, ready to go into its bottle. “You’re holding your breath, closing the doors and hoping there’s not a breeze,” Lemke said. Sometimes, this monumental step does go wrong. Lemke pointed to a two-inch whaler, its frame tilted and its strings still attached. “That’s my shipwreck in a bottle,” Lemke said. “That’s what happens when the bottle slips when all the strings are still attached. I thought, let’s just put a cork in this and call it a day,” he added, laughing. It took three weeks to build the tiny vessel. In all, Lemke has built about two dozen ships in bottles. Lemke, an Army veteran, also recreated the USS Tulare for his father, who served on that vessel in Vietnam. The Tulare replica is held inside a rectangular whiskey bottle and a model of the landing craft his father piloted is inside the hollow glass knob atop the cork. He built the pirate ship from the movie “Peter Pan” on commission, too. He’s next project will be an Ohio River flat boat loaded with barrels and crew inside a hefty one-gallon glass Jim Beam bottle. He’s also planning for USS Rover, the first Navy hospital ship used during the Civil War. It will sit inside a 1920s Bayer Aspirin bottle. Bottle hunting in flea markets and junk stores is part of the fun, Lemke said. 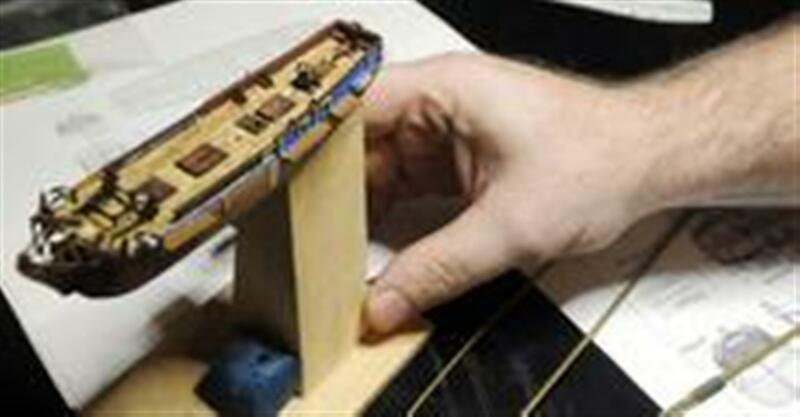 Aside from the artistic element of ship building, the hobby feeds Lemke’s interest in history, he said. Calling himself an amateur historian, he said he enjoys medieval re-enacting and he and his wife are member of the Society for Creative Anachronism. In another venture, he sells leather work to recreationists. He’s done holsters for pistols, for example, and is working on a decorated belt for a Florida woman who plays a fisherwoman turned gladiator. As for the benefits of ship building, it’s much like other artistic outlets. When he’s working in his back-of-the-house studio — his forecastle, you might say — the ship dominates his attention, taking his mind off everything else. “It’s relaxing. It relieves stress,” he said.